Vocabulary… when I was in school this was a subject I dreaded. It always felt like nothing more than busy work. Now that I’m teaching my own kids, I see why those workbooks were so tedious. It’s hard to find an interesting way to teach vocabulary! Except for one year with traditional vocabulary books I’ve hoped vocabulary would develop for my children just from reading great literature. However, my 4th grader seemed to struggle to pick up new vocabulary from reading. If she doesn’t know the meaning of a word, or it is hard to sound out she just skips it. Last year I gave in a picked up a traditional vocabulary workbook, and it was just as I remembered, tedious and boring. Plus, she seemed to have no long term retention of the vocabulary words she studied. Three-fourths of the way through the year I tossed the book in the trash, knowing I needed to find a different approach by the beginning of the coming school year. My research pointed in the direction of WordBuild Foundations, Level 1 by Dynamic Literacy, so when the opportunity came to review this product with the Schoolhouse Review Crew I jumped at the chance. Dynamic Literacy approaches teaching vocabulary in a completely different way than most traditional vocabulary books. No more lists of words to memorize (and then forget.) Instead it focuses on teaching through exponential learning. Learn 3 roots, then 3 suffixes, and the student knows 12 words, add 3 prefixes and the student knows 48 words. Learn just 9 things, but in reality you’ve learned 48 new words! Learn smarter, not harder! If I’ve learned one thing through teaching a struggling learner who doesn’t really enjoy school, this is the key, and Dynamic Literacy definitely meets that requirement. 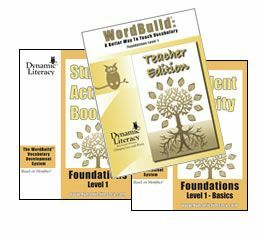 We got to review WordBuild Foundations, Level 1, aimed at students grades 2-5, (or for remedial work for grades 5-9). It includes two student books and a teacher book. Download a sample here. This is one curriculum that you absolutely need the teacher’s manual to get the full potential out of the program. It breaks down each section into 5 days of lessons, walking the teacher through exactly what to teach, what work students should complete, and what to discuss- along with a copy of the student page for each day with answers. The teacher’s guide also includes 5 assessments to check students’ mastery. The student activity books contain fun activities for each lesson, scheduled in the teacher guide so there is no guessing at when to pull out the activity book. Having spent several weeks reviewing this curriculum, my student reaches for her activity book first each day trying to get first teaching time. Each week she looks forward to the magic square activity and the playing with words activities most. The magic square activity makes finding the correct definition to each word fun- it’s also a great activity for self correction. If the numbers don’t add up, try again! Without a doubt we’ve found a winner in this vocabulary program, Rebekah and I both look forward to picking it up again next school year! One more thing- Dynamic Literacy has a guarantee. Use the product for 30 days, and if it doesn’t work for your student return it for a full refund. Even better- how about a discount code just for Big Family Blessings readers? Use code bigfamily at checkout for 25% off books on www.dynamichomeschool.com or 10% off www.wordbuildonline.com. Connect with Dynamic Literacy on Facebook, Twitter, and Pinterest.